If you’re anything like me, and you favor a minimalist lifestyle that prioritizes access over ownership, the prospect of a Library of Things may interest you. A Library of Things (LOT) is a most magical and sensible space where libraries, innovation, and sharing economies intersect. When you visit a LOT, you can borrow items you don’t want to commit to purchasing before you can prove the purchase is truly warranted. Not sure if you’re a fan of camping? Don’t sweat it: check out a tent before dropping the cash on new gear. Wondering if you’re likely to develop a serious interest in cake decorating but hesitant to shell out your hard-earned dollars? Check out some cake pans and decorating accessories. Ready to serenade your cat with ukulele music for any occasion? Stop by the LOT and check out a ukulele. 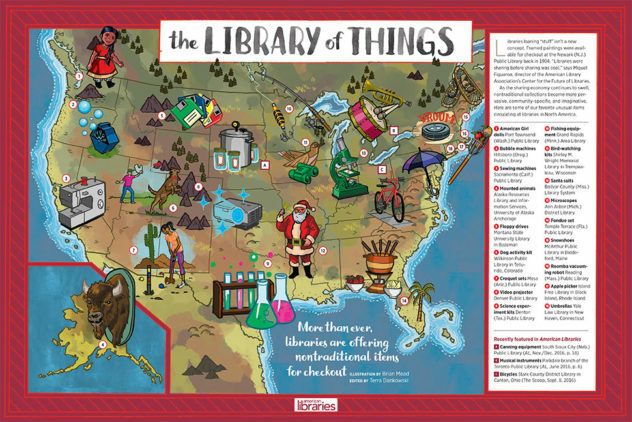 Since libraries are already perfectly structured to lend non-traditional items such as power tools, cake pans, outdoor/adventure gear and equipment, musical instruments and accessories, ties, seeds, and lawn kitchen appliances, it makes perfect sense that innovative libraries have already added many “things” to their circulating collections. At the Hillsboro Public Library in Oregon, for example, patrons can check out a chocolate fountain, popcorn machine, and karaoke machine among many other practical and unique things. At the Shirley M Wright Memorial Library in Wisconsin, patrons can check out bird-watching kits. The Stark County district library partnered with Stark Parks to launch a bicycle sharing program! As you can see, the possibilities are endless. In California at Sacramento Public Library, patrons can check out yard equipment like hedge-trimmers and a lawnmower, among many other things. In this article, Director of the Sacramento Public Library, Rivkah Sass describes libraries as “the original sharing economy” and that when developing a LOT they “were looking at the generation coming up that doesn’t necessarily want to own things. They don’t need a pressure cooker to store on a shelf and gather dust.” Can I get an Amen, people? You don’t have to be a Millennial to appreciate the benefits of a clean, open space that isn’t crowded by a surplus of material possessions you’re likely to use a handful of times before banishing to a lifetime in your kitchen cabinets. Not only does a LOT save you money, but it also saves space, enables access, and encourages discovery and innovation. Come visit Davenport Public Library to see the “Tech-Know Library” and view a full list of the technologies available for checkout including but not limited to: graphing calculators, a light therapy lamp, eReaders, a Go Pro, blue-tooth blood pressure monitor, and Snapchat spectacles! 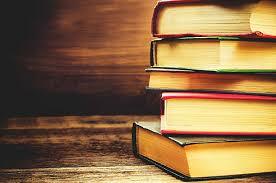 What kinds of items do you think the public library should make available for checkout?